2 Stand Up Guys is your #1 source for Stand Up Paddle lessons and rentals. We have the passion and experience you are looking for. Why choose us over all those cheap discount companies? At 2 Stand Up Guys we go above and beyond in every aspect to guarantee your satisfaction of the sport while reinforcing etiquette and respect for the water and those in it. We are extremely passionate about what we do and thrive off of peoples enjoyment when participating in the sport of Stand Up Paddle Boarding. We provide the very best equipment sized to fit you at any level including a wide selection of top quality epoxy and fiberglass boards to choose from along with a custom fit carbon fiber paddle. We also take pictures during your session and email them to you afterward (complementary). Once you have taken a lesson, you can rent top quality SUP Boards and Paddles at a great price from us. 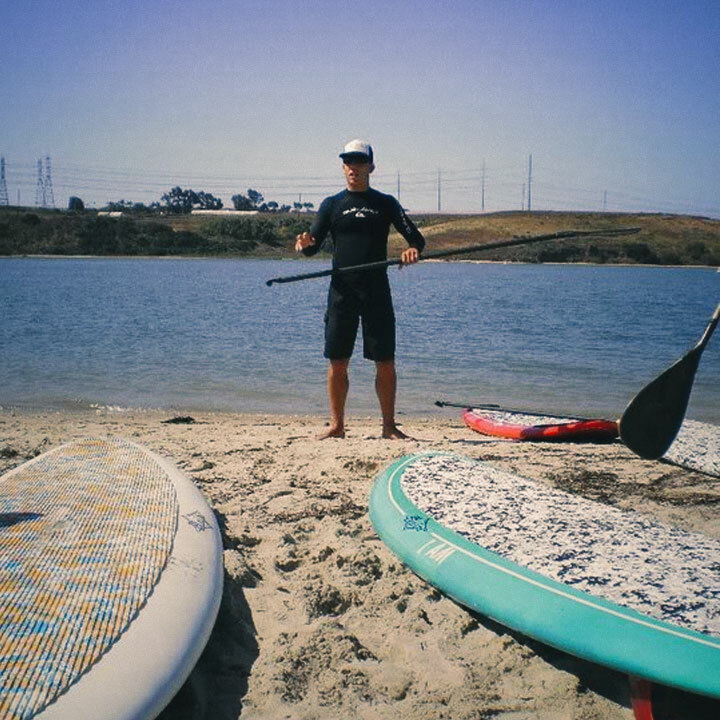 You have found the best Stand Up Paddle Board School in San Diego. At 2 Stand Up Guys we are dedicated to teaching individuals an amazing sport that will not only provide an awesome hobby, but also get people in the best shape of their lives, relieve stress, and cleanse their souls. We are committed to making sure each of our students learn the proper technique, etiquette, and safety that is vital to the sport of Stand Up Paddling (SUP). While many Stand Up Schools are in it strictly for the money and give you 10 minutes of instruction on the beach before sending you on your way with crummy equipment, 2 Stand Up Guys are with you every stroke of the way, right by your side in the water. We understand that everyone learns at their own pace and we will be there through the whole process from stopping the “shaky leg wobbles” all the way to completing a successful “cross bow stroke” and “catching your first wave” in the ocean. We are Certified, specially trained professionals since 2009. Our qualified instructors have been specially trained in CPR/AED and schooled in a one-of-a-kind “Academy of SUP Instructors” (ASI) course. This course, taught by professionals of the sport as well as paramedics and lifeguards, trained 2 Stand Up Guys’ employees in the proper life saving skills, and precautionary safety techniques regarding the instruction of Stand Up Paddle Boarding. Since 2009, 2 Stand Up Guys have been providing the ultimate experience in SUP lessons, rentals, fitness classes, group events, open-ocean SUP instruction and traditional surf lessons. 2 Stand Up Guys has what you need to succeed. One of the happiest and most kind spirited individuals you will ever meet in your lifetime, Matt Poth, a young cancer survivor who promised himself after his long battle, he would live a life involved with his first love, the water. A former sea kayaker, scuba diver, and huge fan of surfing, Matt moved from the East Coast to California in 2009. Since then, he has completely immersed himself in the new world of Stand Up Paddle Boarding. He even met his wife (Olivia) through a mutual love of stand up paddling. They have a toddler that loves to ride on a SUP with mom or dad in the lagoon and a second little boy on the way! Even though Matt enjoys nothing more than sharing his love and introducing people to this great new sport it is his biggest pet peeve witnessing the haphazard reckless growth in which this sport is experiencing. Matt’s goal is to continue pursuing his personal growth with the sport while teaching as many people that want to learn as much about the safety, etiquette, and proper technique as they do about the fun that Stand-Up has to offer. Matt has also gone through CPR/AED certification as well as the “Academy of SUP Instructors” (ASI) class. Matt’s goofy smile, positive reinforcement, and genuine encouragement in and out of the water provide for a unique experience you will not find with any other Stand-Up lesson company. © Copyright 2 Stand Up Guys. All rights reserved.